Taylored Expressions is one of my favorite companies - not only are their designs fresh and innovative but the quality of their product is superb. Below is a sample using the Proud Peacock Cutting Plate that Rosie created. When I first saw the die in the store, I fell in love with it but I wasn't quite sure how to use it...but since I've seen Rosie's projects, well I am just brimming with ideas. See how Rosie used the die as an accent on her layout? And look at this beauty of a card? It is so stunning and that colour combo is timeless. What creative ways have you used your Taylored Expressions Proud Peacock Cutting Plate? Please share them with me. Recently Elizabeth Craft and Karen Burniston joined forces to create the uber amazing accordian dies. It really was a match made in Heaven. The dies come in shapes such as the circle, fancy label and oval shape. They are thin, yes thin and are easily stored in a box. 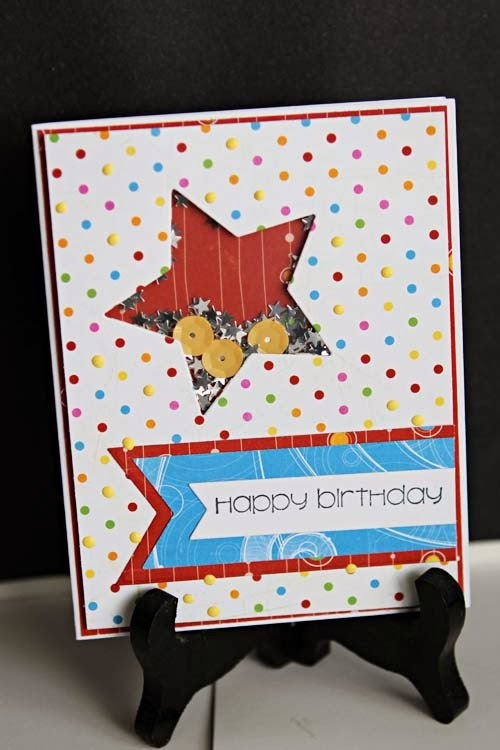 These dies are very versatile - you can make cards, mini albums and even banners with the dies. I will show you a few samples over the next few days on the different ways you can use these wonderful dies. 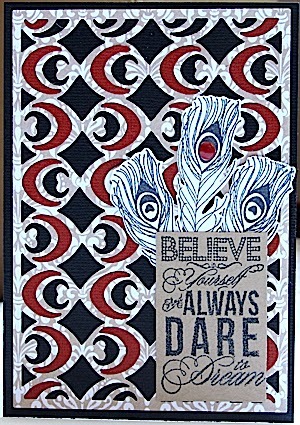 Check out this card by Lorraine from her March reveal which showcases the March 2014 Scrap Shotz monthly kit as well as the Elizabeth Craft and Karen Burniston Accordian Circle die. Isn't Lorraine's card gorgeous? I have the same die and I could not resist making this Minion card that I saw on Pinterest. 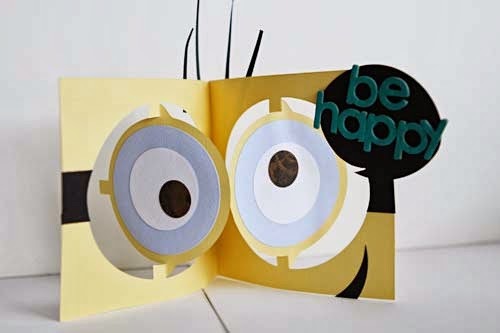 It is perfect for an upcoming birthday party that my daughter is attending with a Minion theme!!!! 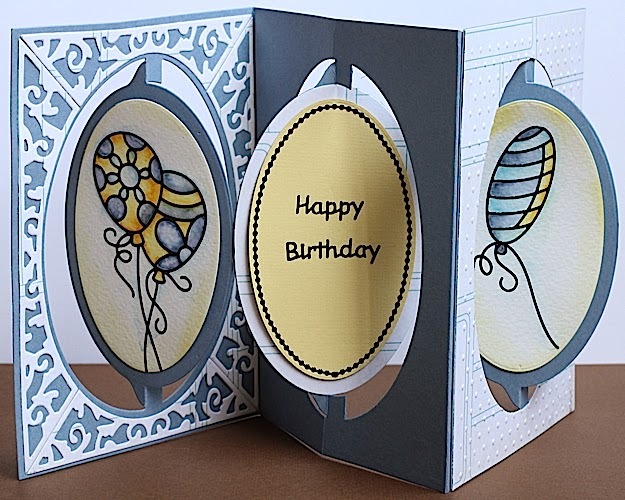 Now let me show you Rosie's jaw dropping card using the Elizabeth Craft/Karen Burniston Accordian Oval Die. See that "filigree" on the card front? 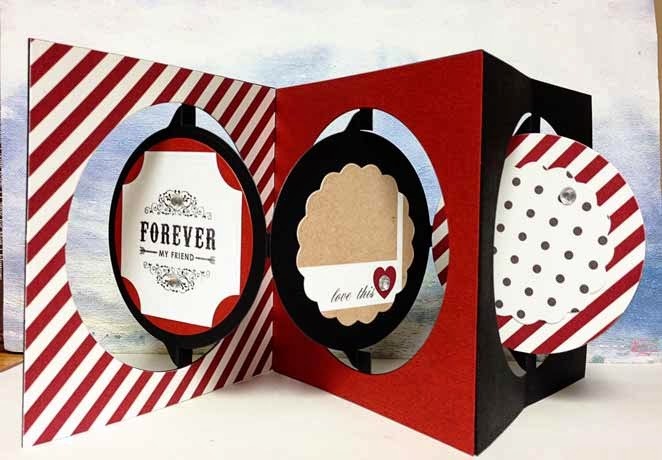 That too is from Elizabeth Craft and is called the Oval Flourish Frame Edge Die Set. And guess what? The die can be adapted to die cut the filigree for the Accordian Circle die too! I know I just had to have it...and so I have it on order right now. It takes your card from beautiful to Wowzers. Just let Sandy know if you would like your own die. What cool projects have you tackled with the Elizabeth Craft/Karen Burniston accordian dies? As mentioned in this post, I have more to talk about sequins, one of my new favorite accents! The different sizes, colours and sheem make these little gems so versatile. 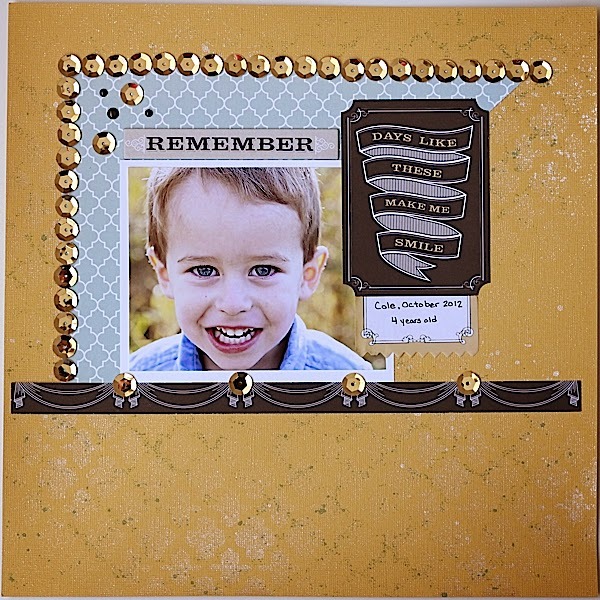 Rosie created a unique photo frame and border on the layout below. She used Glossy Accents to glue the sequins to the layout. I love the look - it very much draws the viewers eye to the focal photo. 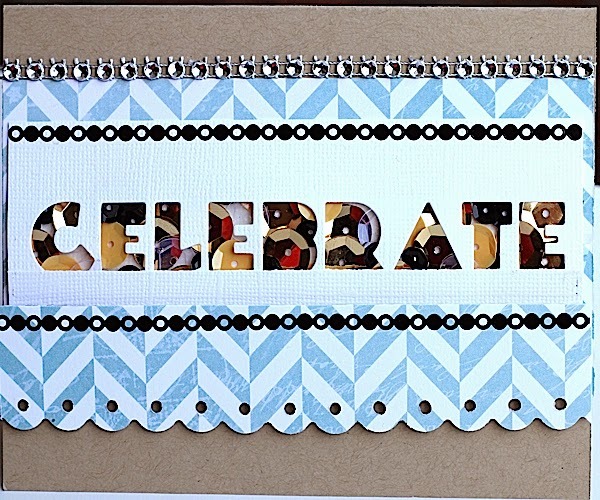 On Rosie's card below, she die cut the "Celebrate" word using this Die-versions Edge die which I will show more samples of in the future too! In the negative space, Rosie adhered sequins to the backing cardstock with Glossy Accents to create a stunning and sparkling card sentiment. Have I inspired you to use your sequins??? One of the hottest trends now is the look of chicken wire. Being a farm girl, I have always loved the versatility of the chicken wire design. It is angular and circular all at once and works on almost every project and event. 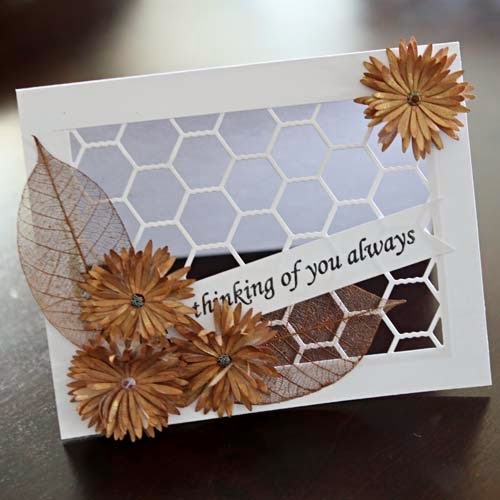 Here is my take on the Cheery Lynn Chicken Wire die. The first is a sympathy card for a dear friend. If you have peeked into the March Scrap Shotz Monthly kit, you would have found the Teresa Collins package of sequins. When I first saw the sequins, I was intrigued by the awesome colours and the different sizes and sheen of them. I love the sequins - there just seems to be no end on what you can use them for. Inside my star-shaped shaker "box" are sequins and some random star shaped glitter from my daughter's craft box. You could have also highlighted the polka-dotted motif of the pattern paper by adhering some the sequins but I am going to save that for another post on sequins soon! Thanks for dropping by - I would love to hear how you are using your sequins too!